ADG 3 provided £2000 each for small-scale community and economic development activities to five diaspora initiatives. One of these was for Riana Development Network. Riana operates in the Nyanza province in Ndhiwa District in Kenya. Riana’s vision is to create a world free from poverty where people have the ability to live life to their full potential. 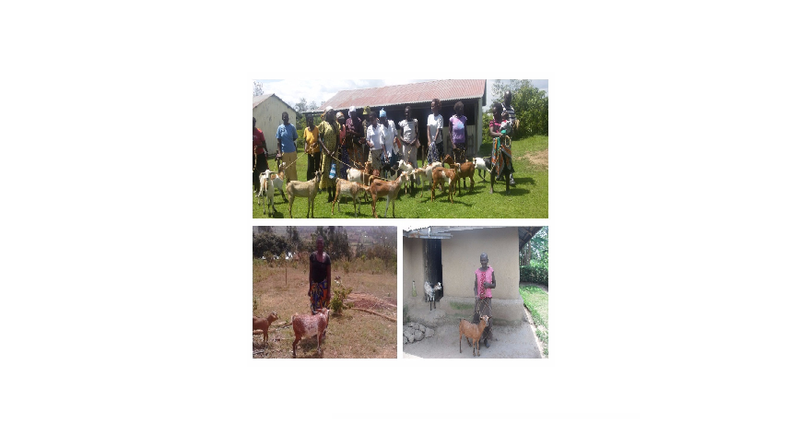 The project – “Food security and livelihoods of small holder farmers through cross-breed goats” was initiated to reduce food insecurity among the local community; and address the lack of resources limiting the productivity and financial security of local farmers. With the help of the ADG3 grant, Riana was able to help 160 people directly: 38 women and youth headed households (with an average of 4 people per household) who are vulnerable as a direct result of the HIV/AIDS epidemic, and many local farmers. This was done through: the provision of goats to 38 households; improving the skills and practices of households and farmers on livestock development, and improving family nutrition and income for poor farmers especially women and youth.